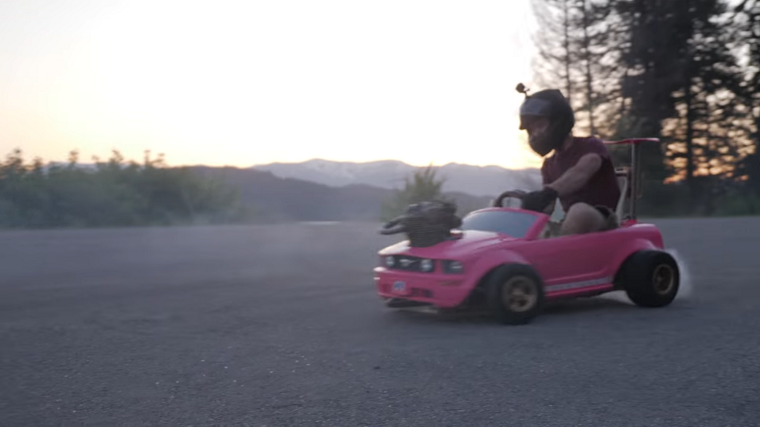 Edwin Olding, a certified petrolhead, created an unlikely marriage between a bright pink Barbie Power Wheels Mustang and engine from a Honda CRF 230 dirt bike. This is not the Barbie car you want to buy your daughter. The project is as ridiculous as it sounds, and was not as easy to put together as it probably seems. Olding’s initial goal was to “find the cutest Barbie Power Wheels car online and turn it into a drift kart,” and it took a good amount of handiwork to get there. The first build involved removing everything but the outer shell of the car and dropping that onto a pre-built go-kart he found on Craigslist, but the frame wouldn’t fit and thus had to be cut and welded back together. As you can imagine, they didn’t keep the weak electric motor. But then the kart’s rear engine was also found to be too lackluster and was swapped out for the Honda CRF 230 dirt bike unit, though not before it was bored out to 240 cc and equipped with an upgraded camshaft and piston. The project took about five days, and the result is a ridiculous Barbie car that makes around 24 horsepower, can go over 70 mph, and features a six-speed transmission with a clutch paddle on the steering wheel. There’s no doubt Olding succeeded at his achieving his goal: the Barbie car really does drift. In fact, with that amount of power and that short of a wheelbase, we’re surprised he can even keep it going straight! This Doesn’t Seem Very Safe… Putting a dirt bike engine in a Barbie car never is, but it could be with Honda Sensing!